Mundo da Robótica | Fazendo a ponte entre a teoria e a prática. This example shows how to convert a harness model that uses a Signal Builder block as an input to a harness-free model with root inports. The example collects data from the harness model and stores it in MAT-files, for use by the harness-free model. After storing the data, the example removes the Signal Builder block from the harness model and adds root inports to create a harness-free model. Then, the data in the MAT-files is mapped to the root inports of the model. This example shows how to use Simulink® to create the thermal model of a house. This system models the outdoor environment, the thermal characteristics of the house, and the house heating system. The sldemo_househeat_data.m file initializes data in the model workspace. To make changes, you can edit the model workspace directly or edit the file and re-load the model workspace. To view the model workspace, select View > Model Explorer from the Simulink editor. 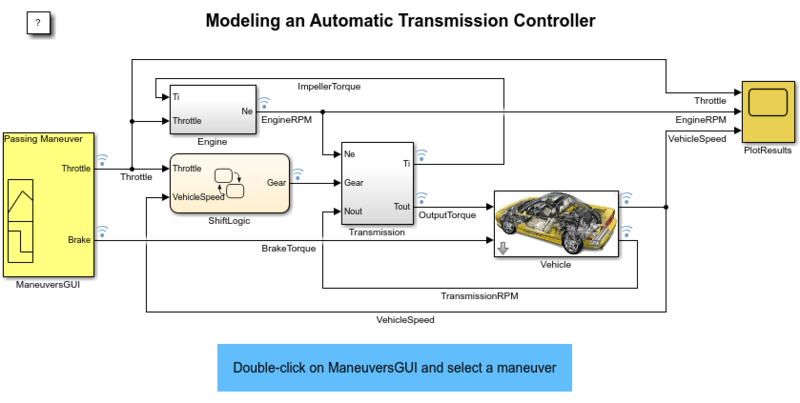 This example shows how to simulate the electrical system of a vehicle using Simulink® and Simscape™ Power Systems™. 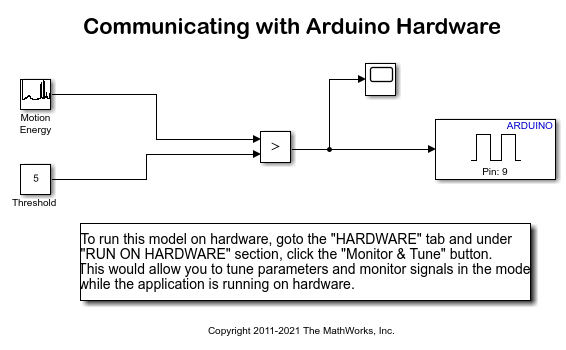 Simulink Support Package for Arduino Hardware enables you to create and run Simulink models on Arduino board. The target includes a library of Simulink blocks for configuring and accessing Arduino sensors, actuators and communication interfaces. 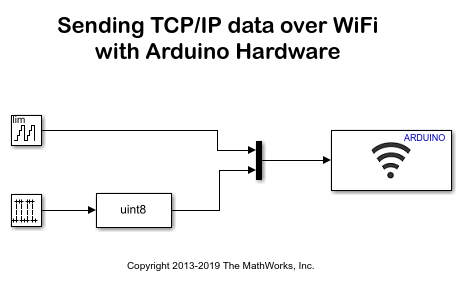 Additionally, the target enables you to monitor and tune algorithms running on Arduino board from the same Simulink models from which you developed the algorithms. Simulink Support Package for Arduino Hardware enables you to monitor and tune algorithms running on Arduino board from the same Simulink® models from which you developed the algorithms. In this example you will learn how to tune and monitor the algorithm in real time as it is executing. When you are developing algorithms, it is often necessary to determine appropriate values of critical algorithm parameters in an iterative fashion. For example, a surveillance algorithm that measures motion energy in a room may use a threshold to determine an intruder in the presence of ambient noise. If the threshold value is set too low, the algorithm may erroneously interpret any movement as an intruder. If the threshold value is set too high, the algorithm may not be able to detect any movement at all. In such cases, the right threshold value may be obtained by trying different values until the desired algorithm performance is reached. This iterative process is called parameter tuning. 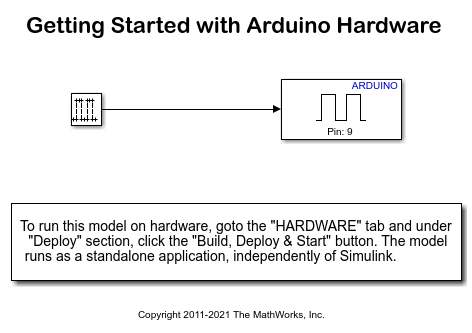 Simulink Support Package for Arduino Hardware enables you to create and run Simulink® models on Arduino board. The target includes a library of Simulink blocks for configuring and accessing Arduino sensors, actuators and communication interfaces. 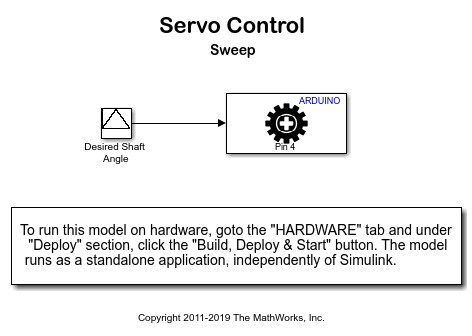 In this example you will learn how to create Simulink model that controls a standard servo motor. In a standard servo motor, the shaft position can be precisely set, usually between 0 and 180 degrees. Servo motors are used in many industrial, military and consumer applications and products. Simulink Support Package for Arduino hardware enables you to create and run Simulink® models on Arduino board. The target includes a library of Simulink blocks for configuring and accessing Arduino sensors, actuators, and communication interfaces. In this example you will learn how to create Simulink models receiving TCP/IP or UDP messages from a remote host and sending TCP/IP or UDP messages to a remote host, identified with a unique IP address and port number. In this example, you will learn how to create Simulink models receiving TCP/IP or UDP messages from a remote host and sending TCP/IP or UDP messages to a remote host, identified with a unique IP address and port number. Simulink Support Package for Arduino Hardware enables you to use the I2C interface to communicate with I2C based devices. In this example, you will learn how to communicate to the Sparkfun digital temperature sensor TMP102. 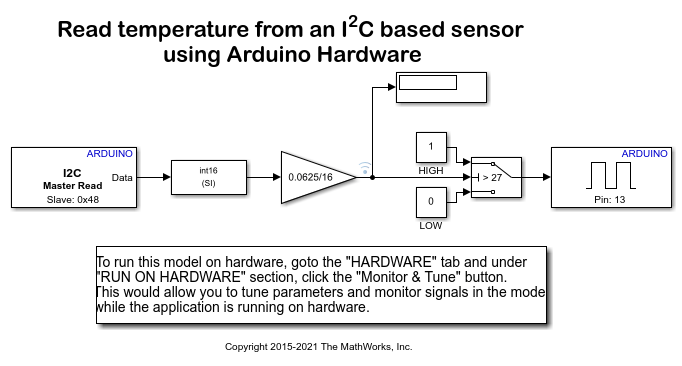 This sensor is interfaced with the Arduino board using the I2C bus. By default, it will send a 12-bit temperature value with a resolution of 0.0625 degree Celsius. You can configure this sensor to an Extended mode that provides 13-bit temperature measurements. For more details about the device, refer to the TMP102 datasheet. 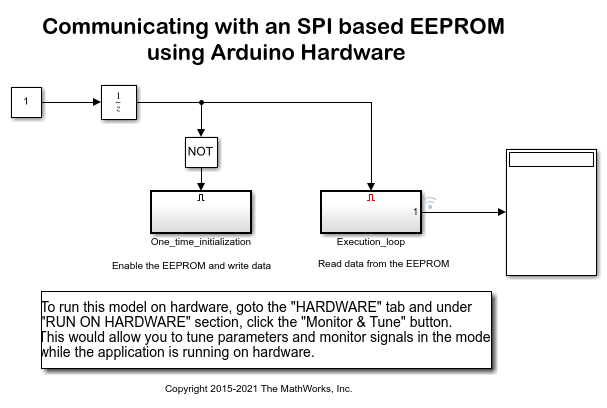 In this example, you will learn how to communicate to an EEPROM interfaced to the Arduino board via SPI. The example uses the 256kB “ON Semiconductor EEPROM CAT25256”. This device uses a standard SPI protocol that is common to many other EEPROMs provided by different vendors. Make sure yours is compatible to the one used in this example. For more details about the device, refer to the CAT25256 datasheet. In this example you will learn how to configure a Simulink model to run Processor-In-the-Loop (PIL) simulation. In a PIL simulation, the generated code runs on target hardware. 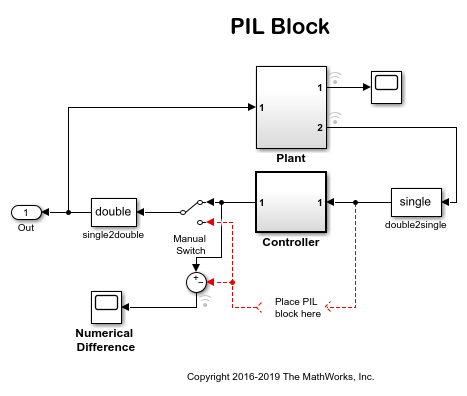 The results of the PIL simulation are transferred to Simulink to verify the numerical equivalence of the simulation and the code generation results. The PIL verification process is a crucial part of the design cycle to ensure that the behavior of the deployment code matches the design. In a vehicle using independent wheel control, applying the same power to each wheel generally does not result in the vehicle moving straight. This is caused by mechanical and surface differences experienced by each of the wheels. To reduce deviation in the vehicle heading, a better approach is to use a closed-loop controller which adjusts the power applied to two motors based on the difference in their rates of rotation. One such controller is a well-known proportional-integral-derivative (PID) controller. 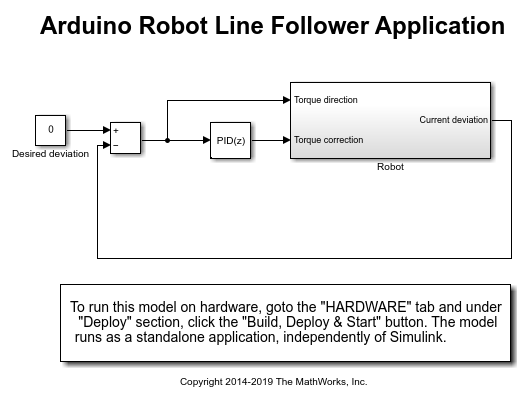 Simulink Support Package for Arduino Hardware enables you to create and run Simulink models on Arduino Robot. This Robot has two Leonardo (ATmega32u4) based boards: Arduino Robot Motor Board and Arduino Robot Control Board. The Arduino Robot Control Board has peripherals such as Analog Input Pins, Digital Input/ Output Pins, PWM, Keypad, Potentiometer (POT), Compass, Buzzer, etc. The Arduino Robot Motor Board has peripherals such as Analog Input Pins, Digital Input/ Output Pins, PWM, Motor Driver, Motors, Wheels, Trimming Potentiometer (TRIM), IR sensors, etc. For more details, refer to the Arduino Robot website. Este tutorial mostra como é possível enviar dados do sensor que são gerados por seu telefone celular para o serviço hospedado em nuvem IBM Internet of Things Foundation e depois criar aplicativos Bluemix™ que processam, visualizam e armazenam os dados. Finalmente, mostra como criar um aplicativo Android para um telefone celular.